I need lower monthly payments on my credit cards because I have less income from a change of job. I am comparing the lower payments with consumer credit counseling services and the lower payment quoted by a debt settlement company. The credit counselor plan is a stretch. The debt settlement plan is a "could work". What else can I use to compare a credit counseling program with a debt settlement program other than the lower monthly payment? I know you guys do settlement and I might ask you to help me if I go that route instead of the other company who has way high fees compared to you. There is definitely more to consider than lower monthly credit card payments when you compare the benefits of a debt management plan with a credit counseling service vs a debt settlement program. You bring up a great point about lower monthly payments offered by both debt solutions. I will make some other comparisons between credit counseling and debt settlement. In the process I will describe how your lower monthly payments work between the two. What I have to share may surprise you. Repayment programs with credit counseling is often referred to as a Debt Management Plan, or DMP. A DMP works to reduce your debt because the credit counselor has preset lower payment concessions worked out with most credit card lenders, department stores, gas cards etc. They also have success in getting medical bills and other unsecured debts enrolled in the DMP. Credit counseling monthly payment arrangements with your creditors (that agree to the debt management plan), are helpful if your monthly budget shows you can afford to pay 1.8 to 2.2 percent of your combined debts that are on the plan. Let’s assume your debts accepted in the plan by a credit counseling agency total $20,000.00. At 1.8% you would pay $360.00 a month to credit counseling for 4 to 5 years and be out of debt. At 2.2% you would pay $440.00 a month to the credit counselor for 4 to 5 years and be out of debt. If your financial situation has you so close to the edge that you need some type of outside assistance, credit counseling is the least confrontational debt relief option. Compare the following 5 benefits. Working with a consumer credit counseling service compared to a debt settlement program will result in a stark contrast regarding elements that will matter a great deal to many of us. Creditors are agreeing to the monthly lower repayment amounts and the over all plan. With an agreement in place you don’t get collection calls. Your credit card and other unsecured debts on the credit counseling plan are combined into one lower monthly payment, sent to the credit counseling company, who then pays your creditors (this is certainly a convenience). You have a predictable payment and time frame to eliminate your unsecured debt accepted into the credit counseling program. Your credit report and credit score does not suffer from 30, 60, 90, 120, 150 day late pays, and charged off account reporting. No collection calls. Easy and more affordable payments. A four to five year plan to get out of debt instead of 15 to 20 years (as is often the case when you pay minimums on your credit card balances as they sit now without intervention). Debt settlement companies market a lower monthly payment. Debt negotiation companies and sales reps are quick to use the lower monthly payment method as a description for how settling debt is affordable. But the difference between how your now “affordable” payment with a debt negotiation approach can impact you, compared to using credit counseling, is dramatic. Your monthly income is not enough to keep up with your debts now, otherwise you would not be on the internet looking for debt solutions. Settlement companies know that. That is why the majority of debt settlement programs are represented as a lower monthly payment – using your monthly income. Debt settlement requires you to have missed payments to creditors in order for the “something is better than nothing” principle that powers successful negotiations of debt to kick in. But debt settlement does not have a monthly payment structure hard coded into it like the income and budget qualification with credit counseling used above. It is therefore easier to qualify more people into a debt settlement plan. Assuming your accounts are negotiated and settled for an average of 40% of today’s balances you will pay $8,000.00. Many settlement companies will charge a fee for their service using a percentage of your enrolled debt. One of the larger companies offering debt settlement calculates their service fee at 22% of your balances at the time you start the program. This adds $4,400.00 to the cost of the program. Add the 8000 and 4400 for a total of $12,400.00. Debt settlement plans are often set up to last 36 months. Dividing the $12,400.00 by 36 means your monthly payment on the debt settlement plan will be $344.44. Estimates for what debt settlement costs you will vary. There are too many variables to list from one persons situation to the next, but some generalities can be easily applied to each of us. The credit card balances are going to inflate with late payment penalties and higher interest rates when they go unpaid. The longer your accounts go unpaid, the higher the balances grow. The estimate above assumed all credit cards would be settled at a combined average of 40% of today’s balances. The 40% settlement assumptions have been a common target used in settlement company sales representations. Given #1 and #2 above, it would be safe to assume (and better to plan for), higher costs to settling the debts over the course of the 36 month lower payment plan. If you assume $2,000.00 in additional costs and add that to the $12,400.00 calculated above, the total would be $14,400. If you are quoted a 36 month debt settlement plan, the lower monthly payment would be $400. That would be similar to the average monthly payment using a credit counseling service. Debt Settlement is a confrontational process because creditors are not getting paid and are not agreeing to anything up front like they do with a credit counseling plan. Here is how debt settlement compares to credit counseling. Creditors are not agreeing to any repayment amount or newly negotiated lower balance. With no agreement in place you will get collection calls. Your credit card and other unsecured debts in a debt settlement plan are not combined into any type of lower monthly payment, it just appears that way (and is also represented that way by sales people). Your monthly payment is typically sent to an escrow account in your name and you maintain sole ownership of the funds. The money accumulates until a settlement is reached, then the account is drained to fund the settlement. You then rebuild the money in escrow to settle the next account. While debt settlement is a fairly predictable process in and of itself, the amount of time and money it will take to eliminate your unsecured debt accepted into the debt settlement company program cannot be known with certainty. Your credit report and credit score will suffer from 30, 60, 90, 120, 150 day late pays, and charged off account reporting. These are some of the major differences between negotiating credit card balances for less and working with a credit counseling agency. Most people reading how I compared the above 2 debt relief options would probably choose credit counseling over debt settlement…. if they can afford to. The fact is, not everyone can qualify for, or afford a debt management plan. In fact, about 70 percent of the people that contact a credit counseling agency cannot be helped with a debt management plan. Debt settlement provides an alternative to bankruptcy. Settling credit card debt is not a good alternative to a credit counseling service if your budget can afford the monthly DMP payment. And there in lies my only caution for enrolling with a credit counseling service if you are approved for a plan – be sure you can meet the new lower monthly credit card payments in your debt management plan every month. You mentioned having already connected with a credit counselor. That’s great! I wish everyone seeking out debt help and advice would take the time to talk with a credit counseling agency as part of their search for a debt solution. Speaking to a counselor about your debt and how the agency may be able to help is free. Anyone reading this who has not connected with a credit counseling service yet should do so. There are more than 100 agencies to choose from. You can reach a counselor for a free counseling session at 888-317-8770. Get an exact quote of what your monthly payment and savings will be. If you get to a place where you cannot meet your monthly payments in credit counseling, or are not sure you can commit to a debt management plan because your income is unpredictable right now, let me know in the comment section below and we can go from there. Hi! I have about $33,000 in credit card debt. Part of that is also a loan that I took out. I have fallen behind at least three months on most of the accounts. I was looking into debt settlement until I read your post. I am trying to figure out whether I should reconsider and do credit counseling or even bankruptcy if that’s the route I have to take. I have a steady income and would be able to make a monthly payment for a management plan, but I was definitely concerned that with a settlement plan they do not pay them until you have a full amount to pay it in the account. I am just wondering what my best plan might be. Fill out the the talk to Michael form in the right column of this page. I will get that and email you to set up a good day and time for a free phone consult. We should only need 30 minutes or so. Given the information you have provided, you are looking at nearly the same outcome using Freedom Debt Relief, or any of the typical debt settlement companies charging the same fees and allowing long program lengths, as you will see with Greenpath and other CCCS agencies. If you take a 3 to 4 year program where you stop paying on all these accounts, your credit stays largely in the dumps until you resolve the debts (all, or close to all of them). Assume it will take you 12 to 24 months to intelligently rebuild your credit. That can mean 6 years time for credit recovery. You then really only have another year to wait for the negatives to drop off your credit. Now add in the costs of settling along with Freedom Debt Relief’s fees, and then throw on any tax you may have to pay on cancelled debt. You may now be really close to paying back the full balances as of today. But you will have risked being sued, been sued, and trashed your credit, all while experiencing some stresses that most of us would like to avoid. Compare that to a debt management plan with Greenpath where your creditors are being paid in 5 years or less, and you do not have the stress, the credit score drop, tax and other concerns. Dollar for dollar, stacked up next to what you get for maybe saving 10 to 20 grand (if you do), makes Greenpath the better choice if it’s me. If you can do debt settlement far quicker, let’s talk about it. How quickly can you pull 40k together? Hi, I am having a hard time making ends meet. I have credit card debt and have tried loans to hold me over. They come at a high interest rate. I am so stressed out. I just want to be able to live on what I make. I am not behind on any payments. It seems that Credit Counseling would be the way for me to go to get my payments a bit lower and manageable. Is that correct? Credit counseling is a good option when income is stable. Post a reply with who you owe, the balance, and the interest rate. I can give you some estimates. Is your job secure and expenses pretty consistent? Thank you so much for the reply. Yes I have a very stable job and income. I owe credit cards and two loans from spring leaf and avant. The total is between $16,000 – $20,000. I filed bankruptcy in 2011 chapter 7. I don’t want to do that again. I just need to get to where I can live within what I make. I have learned so much I these past few years. I think I would rather try credit counseling before anything else if it is possible to lower the total amount paid out per month. Make that call and speak to a counselor in order to get an exact quote of what your payment can be reduced to. You can reach one at 800-939-8357, press 1 when you hear me start talking. It will connect you with a national agency for the free call. If it makes sense with your budget, the credit counseling plan will be the least confrontational and still leave your credit in tact. I’m with DMP for 2 years now paying $860 / month… credit card balance as of today $17000 … ask them to negotiate lower monthly payment they said it can’t be done…Please let me know my alternative don’t want debt settlement..
What credit counseling agency are you working with? Who are the creditors in the plan? My wife and I had fertility issues and amassed a total $37000 in credit card debt and a loan of $11000 to cover medical needs for 2015 (my wife’s pregnant now so we are ecstatic), On top of that we are defaulting on a car loan (we co-signed on a loan for my in-laws who up and decided that they are going to NOT pay for the loan anymore) with a $21000 loan balance while the car is worth $10,000. We also have two vehicles ourselves, we live in Katy, TX where there is no mass transportation which we make monthly payments for as well, $1000 a month total. We also have a mortgage of $980 a month (taxes, insurance, and PMI included). Plus I have $15000 left in student loans. I am in such a struggle to make my monthly payments on EVERYTHING. Minimum payments on our credit cards and loans alone are $1452. After all is said and done, I am lucky to have a NEGATIVE balance of $50 at the end of each month. I have not missed any credit card or loan payments in fear of destroying a credit score I worked hard to build, but with the vehicle loan I co-signed for defaulting (I know, I made a terrible mistake), this just does not matter anymore. I messed up and I don’t know what to do. I am so excited to become a father, but I added $48,000 in debt ($69,000 if we include the co-sign) on to my wife and I in just one year. Prior to that we were pretty comfortable, but now I am so afraid that I cannot provide for my family. What advise can you provide? Thank you in advance. What are the balances and credit card interest rates? Have you made the decision to turn the vehicle the In-laws were paying back in? How did you come about the current value of that car? How much is your wife contributing to the household income right now? I can offer more concise feedback and comparison once you post a reply with answers to those questions. Being able to get clarification about credit counseling and debt settlement is really helpful. I have quite a few debts and I want to be sure that I get them taken care of. Then I won’t have to worry about them for years to come. I like the idea of both of these, but I will probably need to look into them more to be sure that this is what I want to do. Thanks for the great post! I agree that credit card debt is not a good alternative to a credit counseling service. Having more credit card debt can cause a lot of different problems, which moves you in the opposite direction. With a credit counselor you will move towards the right direction. Thanks for sharing. I buy a house 2011 ,its 430,000 I pay down payment 30 percent its al most 130,00,it’s all of my 10years income,plus some of my friend. & younger sister help me pay this amount, after bought this house ( this is one family house) 3month later I had an hurt attack,now I have two ring in my hurt,that time I was in hospital I have lot blooding doctor find I have colon cancer, for this I stay stay in hospital at list one month up, after that I stay in home 9th month ,visitor nurses & pgothrapist come in my home take care me, before I have two job & I work 7days, now I work weekly 3days, my income is very low, I don’t have’ same energy same before, in 10/19/2012 my creditor blance was 71,800, I’m mind that time,I always thinking one day I have a good job & I work full time & I pay full of bills, now i don’t find any way my question is May I have any way? Same like a monthly program payment. Thanks. Are you current with your credit card payments right now? What amount of money can you budget each month for paying down the credit card bills, or for settling the cards one by one? Amy – What are the interest rates you are paying right now? Do you consider both of your incomes to be stable? Do you see any major financial or life decision on a 3 to 5 year horizon? If so, what are they? Our interest rates range from 16 to 29 percent. Yes I work for a college and my husband works for the federal government. No I don’t forsee any major life or financial decisions. We are not behind on payments but end up charging to make it through a month because all our money is going to payments. Any advice is deeply appreciated. Amy – If you can budget roughly 1700.00 to 1800.00 a month consistently, credit counseling would likely be the better route to look into first. Call 888-317-8770 for a free consult and explanation about what that will look like for you. If you learn something that concerns you,or that estimate is not realistic for your budget, post a follow up and lets go from there. Amy – I should have pointed out that the payment I estimated when you sign up for a credit counseling program is based on an average, and with your credit card bills total. That plan will last no more than 60 months, but likely end sooner, with all credit card debts paid, and sanity in tact. My wife and I have about $55,000 in credit card debt and $85,000 is tax debt. If we go with the DPM outlined by a well known non profit orginization we could pay off the credit card debt in just under 4 years. To accomplish this we would have to stick to a very tight budget and as an independent contractor I would have to maintain my current income or increase. We would also have to make an offer in comprimaise with the IRS to settle the tax debt. Monthly payments to the IRS have been included in our monthly budget but that is contingent on the IRS accepting our offer. A chapter 13 bankruptcy plan outlined by a lawyer would save us about $60,000 over the above option but we would obviuosly suffer the ramifications of bankruptcy. Which do you think would be the better option? David – If you are consulting in a growth industry, with geography that further supports your ability to increase your income, I like the debt management plan the credit counseling agency set up. But only after you confirm the OIC with the IRS is a go. If you are in any way concerned about your ability to bring in gigs that will keep your income static, and thereby the DMP and OIC affordable, I like the chapter 13 plan. Chapter 13 is not the ideal form of consumer bankruptcy. It is inflexible once you start, and unforgiving while in it. But it has its place. Between the two options, access to fairly priced credit products are separated by a year. Do you have any children you were thinking you may need to cosign for student loans (parent plus type loans) in the next 3 years? I don’t. My children are still preschool age and younger. The problem with the offer in comprimise is that the IRS will require that I settle in 6 payments which may stretch me depending on the deal I get. Furthermore the OIC can take up to 6 months to establish. In the meantime my cc debt grows with the high interest rates. If my credit will only be negatively affected for 1 additonal year by going with the bankruptcy and I would be saving a considerable amount of money what’s the upside of choosing the debt management? In your opinion would filing for chapter 13 prevent me from landing a better job down the road? Will my credit disadvantage from the bankruptcy or the stigma associated with filing for bankruptcy outweigh my savings from filing? My biggest concern is that I file for bankruptcy and I end up in an airtight position that is no better than the DMP AND have to wear the scarlet “B” for the next 7-10 years. P.S- Does the clock on the Bankruptcy stamp on your report start ticking when you file or when you settle. David – You could start the credit counseling plan, and take advantage of interest rate reduction, then drop out if the OIC is not a workable. You could even put together a strategic plan to settle your credit card debts, and still take advantage of the OIC if you cannot manage the monthly DMP. In other words – IRS first, credit cards last. Assume you need 25k or less to settle the credit cards. How long will it take to pool those resources together while paying the IRS? I know you cannot answer that without more details from them, but rough figures can be planned around. Your credit report and credit score questions are the right ones to be asking. I cover those angles in this report. Your credit will be severely disadvantaged from bankruptcy, but not from the credit counseling plan. It is access to credit products again that track well between credit counseling, settling debts for less, and bankruptcy. I cannot say whether the bankruptcy will affect your future job prospects knowing so little about you. And perhaps not even if I knew more. But let me put it this way: If you were hiring; had narrowed the field to 10 qualified applicants; 3 had filed bankruptcy; would you use that as a criteria to better narrow the field in order to fill a single position? Each person must weigh the better dollar savings for themselves, but I can see why this decision may be for you. I am going to encourage you to also get a handle on what settling your debt might look like as an additional comparison. I can help you do that right here in the comments if you list all creditors and the approximate balances. And also answer the question above. You can also talk to a specialist and get a better idea of what settlement means to you by calling 800-939-8357. The 7 year credit reporting clock for chapter 13 starts at filing, not 5 years later if you complete the repayment plan. My husband was on unemployment for 2 years but for the past year and 1/2 he’s been self-employed but the income is not stable (we have good and bad months). We also owed the IRS at one point which I had to borrow from my 401K to pay. The debt has become a burden and we are overwhelmed because we know we will not be able to get out of debt anytime soon. I owe credit cards totaling about $50K (including $6K Line of Credit at a credit union). I was looking into the Debt Resolution agreement that I recieved today. My concern is that I have been making the minimum payments on all the accounts and have never been past due, but with the debt resolution they asked me once I have signed to stop paying the credit cards. I’m afraid we will recieve bad credit once I do stop making minimum payments. I would like to contact the creditors and explain my situation and hopefully get a settlement plan to avoid any fees (from debt resolution). We’ve always had good credit scores and i’m afraid now my credit report and score will suffer and charge off accounting reporting. I rather resolve the debts now rather than later if we were to hit a budget shortfall. Gabriela – Every form of debt relief will impact your credit score or your ability to obtain credit. Credit counseling programs lower the monthly payments on your credit cards and loans, but make it tough to get new loans for a few years (with some exceptions). Settling these same accounts (what you described with Debt Resolution) means making your over all debt more affordable by negotiating lower pay offs (not monthly payments), but the trade off is indeed your credit score, but possibly not for all that long. Thing is, with the amount of debt you have, and your current income not being enough to support the payments, you are unlikely to get approved for new credit and loans anyway. So what is it your credit is really doing for you right now? There is no way to call your creditors and resolve the debts now in a manner consistent with settling.None of them will have that conversation with you until you are at least a few months late. You can talk to them about lowering the monthly payments, and some may offer a temporary (3 months to a year) plan at a lower monthly rate. Others will not make a lower payment deal with you directly while you are current with payments, but would do that for you if you were working through a credit counseling agency. My advice – drop any concern about your credit reports and credit scores until you first figure out what you can confidently afford. Can you come up with 850, 950, 1050 a month to pay these bills? If that is not a stretch than call and talk with a counselor about a DMP at 888-317-8770. You would be better off working with an agency than trying to get the same thing done on your own, as some creditors will not offer you what you can do through an agency. If you have no shot at affording a reduced monthly payment plan, how long will it take you to raise about 25k? Some people in your situation may take 2 to 3 years to raise the money, and that can work. But I have always preferred to be realistic about why raising the money needed to settle your debts as quickly as possible is best. You may not need all of that 25k, but to narrow the estimate you will need to post a list of your creditors and the approximate balances owed. 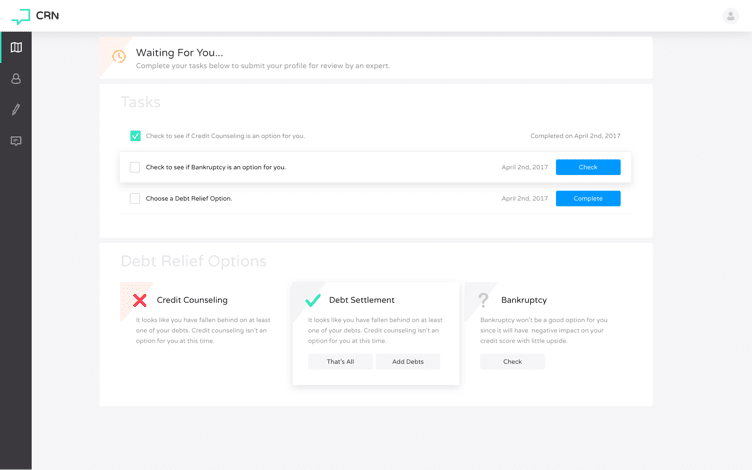 This site is all about helping you settle debt on your own, and that is one way to get through the process quicker… not paying professional fees means your money goes to the settlements you negotiate. You are welcome to post questions and concerns after reviewing those resources. I had a question with my credit cards. I currently owe BofA around 6500 in credit card debt and Discover around 6000. BofA offered to settle for 850 for 3 months and Discover a lump sum of 2500. I don’t plan on buying a house anytime soon and was wondering if I should take their alternative solutions of 5 year payoff plans with 100 monthly payments and near 1% and 4% rates. aaron – Paying 100 a month toward the credit cards, and at the reduced interest rates offered by BofA and Discover, is a good option if you can afford that, and if you have a stable income. If your income is not stable, the settlements on both accounts could prove to be the better approach to resolving the debts now, rather than face debt settlement if you later hit a budget shortfall. I am assuming your accounts are already several months past due, but not quite 6 months late? My father recently passed away and I am in the process of helping my mom figure out the best plan for her financially. She has limited income, hoever can afford her house payment and the car payment. The 2nd mortgage and credit cards are hurting her. My sister was trying to get her to go with Christian Credit Counselors, but I have read not good things about going this route. One person was paying almost $1000 a month and 50% of his payment was going towards the fee. I feel this is too risky for my mom and would not feel comfortable that they would not take advantage of her. What are your thoughts? Catherine – First things first. What state does your mom live in? Is the 2nd mortgage a total of 45k (not 450k as it reads above), and is that separate from the 140k owed on a first mortgage? Depending on the answer, chapter 7 bankruptcy will become part of the options she can consider along with a credit counseling agency, or settling debt. I agree with you on concerns with your mom using Christian Credit Counselors. Anyone charging 50% of the monthly payment as fees is not very christian, and may actually be operating illegally based on the current laws that debt management plans and debt settlement plans must conform to. A true nonprofit credit counseling agency would enroll your mom into a repayment plan for just the credit card debts. I estimate the monthly payments through one of these agencies, consolidating all of the credit card payments into one single amount, would be roughly 800.00. That would be the same amount for the life of the balances and she would be rid of the credit card debt in 60 months or less. The credit counseling route would not impact the car loan, nor would it do anything with the house payments initially. But many nonprofit agencies are HUD certified counselors that can look into any programs available to your mom to reduce her monthly housing expense. You can reach a credit counselor at 888-317-8770. Settling the credit card debt for less will often mean coming up with about 40% of the total balances (depends on who the credit cards are with), over a reasonable period of time, and while the normal credit card payments are not being made. That means coming up with about 16k. What would you estimate your mom’s ability to come up with 16k, and over what period of time (measure in months)? Settling will not have an impact on the car loan, or the housing situation. If you can answer my questions above in a comment reply, I can offer more feedback. You should also look to read through our critical debt settlement reports. You will be glad you read through them. Debt settlement is not a bad thing. It is often a necessary thing if you cannot afford your minimum payments on your credit card bills, but want to avoid bankruptcy. Sure it will impact your credit rating and access to new credit products while you settle off the debts, and for a period after you are done, while you rebuild credit. Are there surprises to debt settlement? For most people who sign up with a debt settlement company, I find there are many surprises. That is because debt settlement is often a soft sell, only hitting on its affordability etc., and only glossing over any risks to the process. Credit counseling just does not have the “gotchas” associated with the lower payment plans that debt settlement programs have. That is why I answered the question the way I did. So, surprises? Not if you read the settlement part of the debt relief series linked above and follow that up by reading the critical reports about debt settlement too. I would love it if you came back to this page and post a comment reply if you found the details in the series to surprise you.